A revolutionary. Mexican photographer Pedro Meyer (b. 1935), is a pioneer of the digital revolution in contemporary photography, one of the first photographers to manipulate his images digitally. 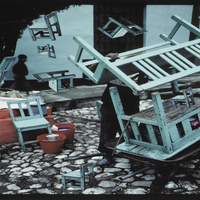 Because of its mechanical nature, photography has often been misconstrued an unbiased reproduction of a single moment, a snapshot of the exact truth – something that Meyer actively disputes in his work. Meyer is renowned, not only for digital manipulation, but also for his powerful and provocative photographs that share his complex vision of reality. Meyer insists that all photographs – manipulated or not – are equally true and untrue. He argues that digital manipulation continues in the tradition of so-called “straight photography” in which unwanted details are cropped out, or the photographer asks his subject to step out of the shadows into better light. Seen this way, a photographer digitally editing a photograph is no different from a photographer offering stage directions from behind the camera. Both take liberties with the “truth” in service to the photographer’s vision. This exhibition showcases Meyer’s approach toward capturing the truth of a moment, complete with concrete reality of memories and emotions. Exhibition hours are Monday – Thursday 8AM – 10PM, Friday 8AM – 5PM, and Weekends: 10AM – 5PM.